On June 28, 2018, after full briefing and oral argument, a Lake County Circuit judge agreed with the legal arguments advanced by SR partners, Gregory Scandaglia and Eric Muñoz, and dismissed with prejudice a breach of contract action asserted against the client, a California-based bank accused of wrongfully refusing to reinstate a mortgage contract. In its motion to dismiss briefing, SR argued that the mortgage contract at issue in the case was legally inoperative because it had been previously merged into a prior judgment. The court also agreed with SR's argument that the contract action was legally barred under the doctrine of res judicata because prior litigation had adjudicated the same set of issues. The court also sided with SR that the contract action was untimely filed in violation of Illinois' 10-year statute of limitations for written contracts. The court's decision not only confirmed the legal strategy mapped out early in the case by SR but also saved the client the time and expense of continued litigation including any discovery, further motion practice, and trial. February 2018 - SR Wins Dismissal of Negligent Hire Claims in Groundbreaking Preemption Ruling. On February 7, 2018, SR obtained a major ruling from the U.S. District Court for the Northern District of Illinois in the matter of Volkova v. C.H. Robinson, No. 16 C 1883, 2018 WL 741441 (N.D. Ill. Feb. 7, 2018) (J., Guzman). SR partners, William Ryan and Eric Muñoz, argued, and the Court agreed, that plaintiff's personal injury and wrongful death claims based on a negligent hire theory of liability against a freight broker were preempted by the Federal Aviation Administration Authorization Act of 1994. After extensive briefing, the Court accepted SR's fully researched and well-reasoned arguments that plaintiff's allegations that the freight broker failed to perform sufficient investigation and evaluation of the motor carrier (and its driver) necessarily fell within the preemptive scope of a federal law that barred any state law "related to a price, route, or service of ... any broker ... with respect to the transportation of property." The Court's order is the first of its kind in the United States applying federal preemption to dismiss personal injury and wrongful death claims against a freight broker. February, 2018 - Scandaglia Ryan Presented Its 2017 Legal Writing Award to DePaul Law Student. Scandaglia Ryan continued the tradition of honoring a DePaul University College of Law Student with the Scandaglia Ryan Intellectual Property Legal Writing Award. The 2017 recipient was Samantha Phillips, a 2L, who received the award at the Center for Intellectual Property Law and Information Technology (CIPLIT) reception on February 20, 2018. The award is given annually to the student who receives the highest grade in the first year IP legal writing program, which is part of DePaul's first-year Legal Analysis, Research and Communication curriculum. Samantha is a member of the DePaul Law Review and has received two CALI Excellence for the Future Awards. Samantha is pursuing a JD/MS (cybersecurity-computer security) degree which she expects to earn in May, 2020. Scandaglia Ryan founded and has been sponsoring the IP Legal Writing Award since its inception in 2002. Past recipients include Jonathan M. Crowley, Kyle Dickinson, Stephen C. Jarvis, Nicholas C. Thompson, Emily Monteith, Justin Piper, Jonathan Schildt, Nicholas J. Angelocci, Jamey A. Orchik, Lee James, Jeremy Bridge, Hillary A. Mann, Philipp Ruben, Lauren Bursey and Nolan Leuthauser. Pictured below: Therese Tully, William Ryan, Samantha Phillips, Gregory Scandaglia, Eric Muñoz, Michael Shapiro and Joseph Swee at the 2018 Reception. October, 2017 - SR Wins Reversal of $10 Million False Claims Act Judgment. On October 23, 2017, the Seventh Circuit Court of Appeals reversed a judgment exceeding $10 million in a False Claims Act case brought by the federal government. United States v. Luce, 873 F.3d 999 (7th Cir. 2017). SR partner Michael Shapiro was lead counsel in the appeal, arguing that the standard for causation of damages used by the government was contrary to the requirements of the False Claims Act. The appellate court agreed, vacating the judgment against SR's client and reversing its own twenty-five-year-old precedent on this issue. Mr. Shapiro successfully persuaded the Seventh Circuit to replace but for causation with proximate causation in False Claims Act cases. November 2017 - SR continues its support of the Kelly Hall YMCA for the fifth consecutive year. The Kelly Hall YMCA, located in Chicago's West Humboldt Park neighborhood, provides a number of services to the community, including youth sports, day camp, a food pantry, and youth development programs. SR partner Gregory Scandaglia has served on the board of the Kelly Hall YMCA since 2013. SR is proud of its continued support for the Kelly Hall YMCA. February, 2017 - SR successfully obtains insurance coverage for property owner facing massive water damage. SR partners Gregory Scandaglia and Michael Shapiro recently obtained insurance coverage on behalf of a client who incurred hundreds of thousands of dollars of water damage to his property. SR successfully worked with the insurer and its outside counsel to position the claim for coverage despite a dispute over whether the property owner had exercised reasonable care. The insurance company elected to cover the claim after deposing the client. Working cooperatively in this manner avoided the necessity of filing a lawsuit to seek insurance coverage. January, 2017 - Scandaglia Ryan LLP Names Michael Shapiro a Partner of the Firm. Michael S. Shapiro was named a partner at Scandaglia Ryan LLP effective January 1, 2017. Mr. Shapiro has extensive experience representing clients in matters involving commercial litigation, complex torts, breach of contract, breach of fiduciary duties, restrictive covenants, employment disputes, declaratory judgments, shareholder disputes, the False Claims Act, and internal investigations. Mr. Shapiro joined Scandaglia Ryan LLP in 2011. Prior to that time he practiced at several national law firms and served as a law clerk for the Honorable Matthew Kennelly of the United States District Court for the Northern District of Illinois. He received a J.D. with high honors from Chicago-Kent College of Law where he was editor-in-chief of the Chicago-Kent Law Review. He also earned a B.A. in finance from the University of Illinois at Urbana-Champaign. 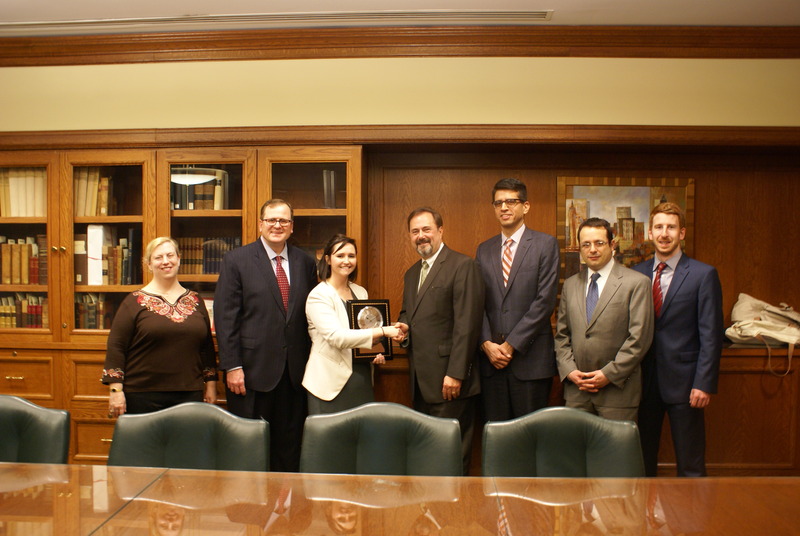 February, 2017 - Scandaglia Ryan Presented Its 2016 IP Legal Writing Award to DePaul Law Student. 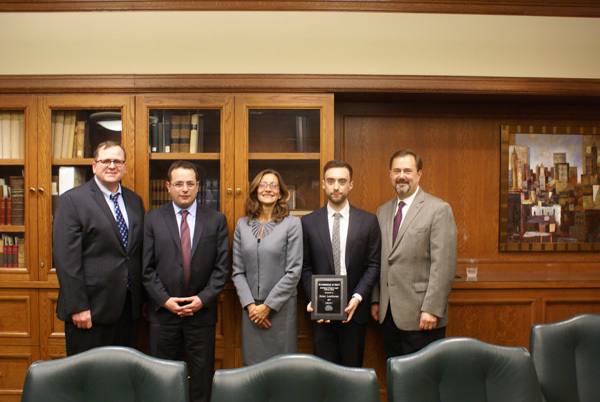 For the fifteenth year in a row, Scandaglia Ryan presented the Scandaglia Ryan Intellectual Property Legal Writing Award to a DePaul University College of Law student. The 2016 award recipient was Nolan Leuthauser, 2L, who received the award at the Center for Intellectual Property Law and Information Technology (CIPLlT) reception on Tuesday, February 7, 2017. The award is given annually to the student who receives the highest grade in the first year IP legal writing program, which is part of DePaul's first-year Legal Analysis, Research & Communication curriculum. Mr. Leuthauser's outstanding grades also earned him numerous CALI Awards. He expects to earn his J.D. in May 2018. Mr. Lethauser is also a member of the DePaul Law Review. Scandaglia Ryan founded and has been sponsoring the IP Legal Writing Award since its inception in 2002. Past recipients include Jonathan M. Crowley, Kyle Dickinson, Stephen C. Jarvis, Nicholas C. Thompson, Emily Monteith, Justin Piper, Jonathan Schildt, Nicholas J. Angelocci, Jamey A. Orchik, Lee James, Jeremy Bridge, Hillary A. Mann, Philipp Ruben and Lauren Bursey. November 2016 - SR continues its support of the Kelly Hall YMCA for the fourth consecutive year. June 2016 - Seventh Circuit Court of Appeals Affirms SR Trial Victory. On June 20, 2016 the Seventh Circuit Court of Appeals affirmed the jury verdict in favor of SR client Semir Sirazi. The appellate court held that the jury reached a proper conclusion following a two-week trial that Mr. Sirazi's contract rights and security interests were violated by several companies working in conjunction with notorious Illinois businessman Tony Rezko. The court also agreed with SR's cross-appeal and reinstated personal liability against one of the individual defendants, finding he personally benefited from the deals at Mr. Sirazi's expense. The court's ruling was the subject of several newspapers articles in the Chicago Tribune, and Crain's among others. The appeal was litigated by SR attorneys Gregory J. Scandaglia, William J. Ryan, and Michael S. Shapiro. April 2016 - The National Law Journal recognizes SR for obtaining one of the Top 100 Verdicts of 2015 in the United States. Trial can sometimes be the only way to reclaim legal rights that have been violated by a wrongdoer who thinks it is beyond the reach of the law. A recent SR client story is a case in point and was selected by the National Law Journal as one of its Top Verdicts of 2015. By the time our client came to us, his legal right to be repaid what he was owed was destroyed. The security interest he relied upon was misappropriated and the proceeds already distributed overseas. The defendants were also overseas and refused to recognize his claim to repayment. It took extensive investigation and the persistence to overcome a barrage of legal defenses to give our client his day in court. Together we made that day count. In the end, our client's rights were vindicated and the defendants forced to answer fully for their misconduct. November 2015 - SR continues its support of the Kelly Hall YMCA for the third consecutive year. July 2015 - SR successfully defend sentence of probation and community service for tax evasion related to undisclosed Swiss bank account on appeal. In January 2014, SR obtained a sentence of probation and community service of an individual who pleaded guilty to one count of tax evasion arising out of a foreign bank account worth over $100 million. The government appealed this result. On July 10, 2015, the Seventh Circuit Court of Appeals affirmed that sentence, finding it was reasonable based on the sentencing arguments presented in the lower court. SR partner Gregory Scandaglia served as lead counsel throughout the case, assisted by SR attorney Michael Shapiro. United States v. Warner, 792 F.3d 847 (7th Cir. 2015). Following a two-week trial in the case of Sirazi et al., v. General Mediterranean Holding, SA et al., in the U.S. District Court for the Northern District of Illinois, the jury returned a verdict in favor of Mr. Sirazi and his companies Greenstone Capital LLC and Mardini, Inc. in the amount of $22.9 million, including $10 million in punitive damages. The case involved a complicated dispute arising out of Defendants' willful disregard for Mr. Sirazi's security interest in the proceeds from felon Tony Rezko's ownership interests in a 62 acre parcel of land in the South Loop of Chicago. Despite the complexity of the case, the jury needed only hours to determine that Defendants had acted wrongfully and return a verdict in Plaintiffs' favor for tortious interference with contract, civil conspiracy, and unjust enrichment. "We are grateful that the judge and the jury worked hard and gave our client careful consideration of his claims," said Gregory Scandaglia, co-founder of the firm. "We think this result was a long time coming and we're very pleased the system worked." The trial was the culmination of seven years of litigation that began when Mr. Sirazi approached SR in the spring of 2008 after learning from the US Attorneys' office that Rezko had unlawfully sold his interests in the 62 acres without obtaining Mr. Sirazi's consent or tendering the proceeds to him, as was required by the terms of a Settlement Agreement between them securing Rezko's debts to Sirazi and his companies. In addition to the federal trial, the litigation included numerous twists and turns, including an involuntary bankruptcy against Rezko and a protracted battle over personal jurisdiction that culminated in a sanctions ruling against the Defendants when they refused to turn over information about Liechtenstein entities that they claimed owned GMH. Mr. Sirazi has stated that he feels vindicated by the verdict. In addition to Mr. Scandaglia, the team working on this matter included William J. Ryan, Seth Yohalem, Michael Shapiro and Michele Miner. Scandaglia Ryan is proud to support the Ronald McDonald House Charities® of Chicagoland & Northwest Indiana. The RMHC-CNI provides a 'home away from home' for families of pediatric patients being cared for in its partner hospitals, including Advocate Hope Children's Hospital, Children's Memorial Hospital, Loyola University Medical Center, University of Chicago Comer Children's Hospital, and the new Ann & Robert H. Lurie Children's Hospital of Chicago. The charitable organization also reaches out to children in need with mobile medical and educational opportunities. Scandaglia Ryan is proud to continue its support of fundraising team Elena Rocks in connection with the American Cancer Society's 2012 Relay for Life of Barrington, Illinois. On June 8, 2012, team Elena Rocks will camp out overnight at Barrington High School, with members taking turns walking around the track for 12 hours. Junior High student Nick Rodriguez formed the team a few years ago because he wanted to do something positive for his 10 year-old sister, Elena Rodriguez, who has battled cancer since she was 13 months old. Last year, team Elena Rocks was the #1 fundraising team in Barrington out of 140 teams, raising more than $16,000 for the American Cancer Society. Scandaglia Ryan made a special contribution to the Rush University Medical Center - Parkinson's Disease Program, one of the nation's largest and most respected movement disorders centers. The center's focus is to conduct research into the causes and treatment of Parkinson's disease and other movement disorders and to provide state - of - the - art care for movement disorder patients. Funds raised in connection with a March 24, 2012, benefit are being matched by the Parkinson's Disease Foundation. Scandaglia Ryan is proud to support Legal Prep Charter Academies, a new Chicago area college prep school whose curriculum is centered around the development of those skills, such as written and oral communication, critical thinking, problem solving, and advocacy, which are found in great lawyers and leaders. Legal Prep will open its doors in Fall 2012, serving more than 800 children from under-resourced communities. Scandaglia Ryan welcomes Associate Michael S. Shapiro to the firm. Mr. Shapiro comes to us with significant experience representing clients in commercial litigation, complex tort defense, declaratory actions and civil rights defense matters. Previously, Mr. Shapiro practiced at SmithAmundsen LLC, in the Commercial Litigation and Aerospace Practice Groups, and at Foley & Lardner in the Commercial Litigation and Appellate Practice Groups. He also served as a law clerk for The Honorable Matthew F. Kennelly, U.S. District Court for the Northern District of Illinois, during the 2008-2009 term. Mr. Shapiro received a J.D. from Chicago-Kent College of Law in 2003, where he was the Editor-in-Chief of the Chicago-Kent Law Review. He received a B.A. in Finance from the University of Illinois at Urbana Champaign in 2000. Scandaglia Ryan is proud to support Team Pactiv's participation in the August 6-8, 2011, CowaLUNGa Bike Tour, sponsored by the Respiratory Health Association of Metropolitan Chicago. RHAMC is a non-profit organization that fights lung disease and promotes healthy lungs through research, advocacy and education. Its programs and outreach efforts serve patients and families affected by lung cancer, asthma, chronic obstructive pulmonary disease (COPD), emphysema, and other lung diseases. The CowaLUNGa Bike Tour starts at the Gurnee Mills Shopping Mall and travels into Wisconsin with overnight stops in William's Bay and Whitewater. This will be Team Pactiv's fourth year participating in the event, raising nearly $50,000 for the RHAMC.